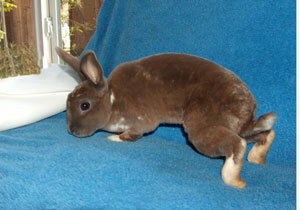 Keilly was a beautiful, very small, mini-rex girl. She was dropped off into n East Bay shelter night drop box with no information, so we are not sure why her legs were injured. Through x-rays, we learned that her back bone was injured at some time in her short life. One of her legs jutted out on the side and she sort of dragged it behind her. The other leg had some atrophy. But she was fast and loved to run and play! She was a darling, little girl with a love of life. She was a real delight and such a pretty little girl. Keilly, your life was too short and we loved you very much.